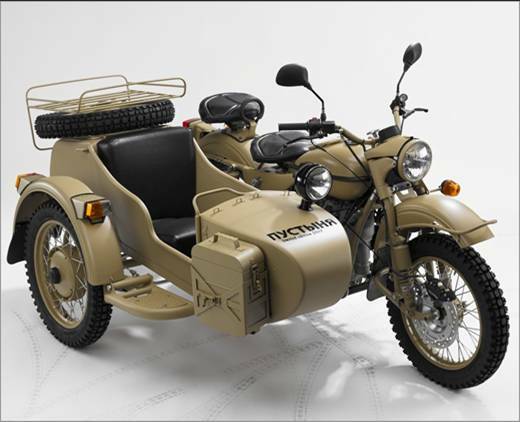 Why did we choose Ural sidecars? 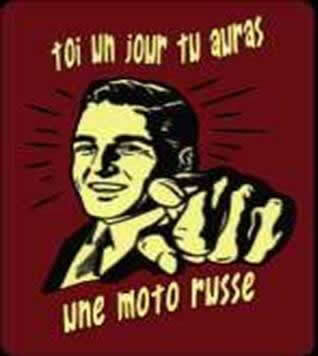 As you will read below the Ural sidecar is part of history. You may have had the chance to see those sidecars in war movies such as The Great Escape or Indiana Jones. 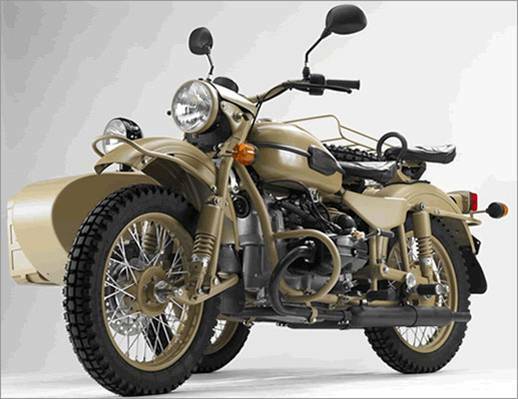 Ural sidecars are still produced in Russia and it is therefore still possible to buy new models. They are used in Central Asian countries and we hope to take advantage of that in case we need to find people able to fix them. Bottom line, our choice is made of a crush for the "vintage" style of those bikes, the safety they bring by being sidecars and their adaptability to any kind of environment. 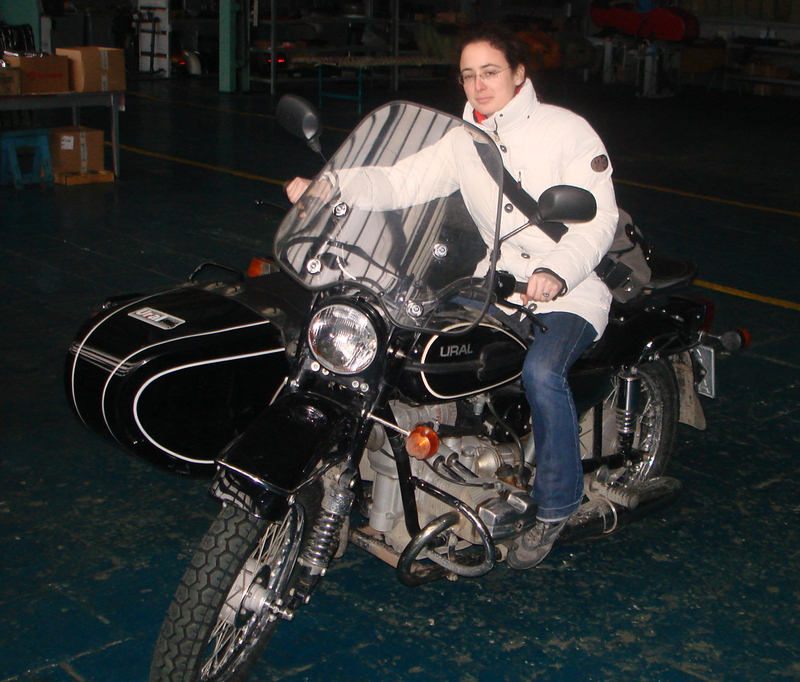 The purchase of our Ural Sahara sidecars would not have been possible without the great help of Elisabeth. Elisabeth is clearly part of our team and she will join us on the Road of Empires to cross Ouzbekistan and Kazakhstan. Elisabeth works at the French Embassy in Moscow and thanks to her connections we managed to buy the Ural Sahara limited edition. As early as the 1930's, a Russian company, Uralmoto Zavod, was producing motorcycles & sidecars in co-operation with BMW, Germany. The rising German administration of the 30's, needed military equipment, but the terms of surrender imposed under the Treaty of Versailles at the end of World War I prohibited Germany. They then developed a strategy to get around these restrictions by pursuing joint ventures with Russia. This was achieved by the signing of a 7-year trade agreement known as the Molotov-Ribbentrop pact (also known as the Hitler-Stalin pact or Nazi-Soviet pact & formally known as the Treaty of Nonaggression between Germany & the Union of Soviet Socialist Republics). It was signed in Moscow on 23 August 1939 by the Soviet foreign minister Vyacheslav Molotov & the German foreign minister Joachim von Ribbentrop. Despite this agreement, Germany apparently only ever willingly shared information about the then new BMW R71 design. This model was only built in Germany for a short time & in limited quantities (from 1938 to about the end of 1939); it was a migration from the stalwart Wehrmacht BMW R12 model. The R71 signalled the move away from the conventional pressed steel frame bikes to the higher strength oval tube frame design which was easily able to cope with the additional stresses of a sidecar attachment. Germany of course, never shared the design of the newly developed successor, the BMW R75 with the Russians. The BMW R75 was introduced in the spring of 1941, built according to German war ministry instructions, without cost limitations. This high performance war machine had incredible off-road capabilities due to its driven sidecar wheel drive, locking differential, reverse gearbox & selectable low range gearbox. The non-aggression treaty with Russia lasted until Operation Barbarossa of 22 June 1941 when Nazi Germany invaded the Soviet Union. In response, Russia joined forces with the Allies against Hitler. By then Russia had obtained certain BMW tooling & the designs for the R71 & the Russian militarised R71 versions was renamed the M72. This was almost identical to the original BMW R71. After the German surrender, the Allied occupation forces had "access" to the shattered remains of Germany's once impressive automotive industry. 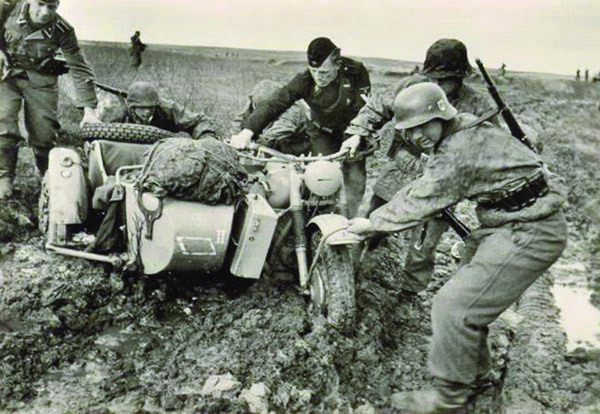 The BMW motorcycle factory, which had been relocated to Eisenach during the war (where they produced the superior BMW R75), fell into German territory occupied by the Russians. The Russians then took possession of all the BMW blueprints & tooling & shipped the few remaining BMW R75 motorcycles & all the production parts & blue prints left at the factory back to Russia. The R75 dual wheel drive system design technology was then used to create the relatively advanced Russian military dual wheel drive overhead-valve "Ural" & "Dnepr" models. During 1950 the Chinese "People Liberation Army Beijing No.6 Automotive Works" had been attempting to develop a suitable military motorcycle by "reverse engineering" a Zundapp KS500 military motorcycle. This machine entered production in 1951, and a total of 4,248 machines were built. 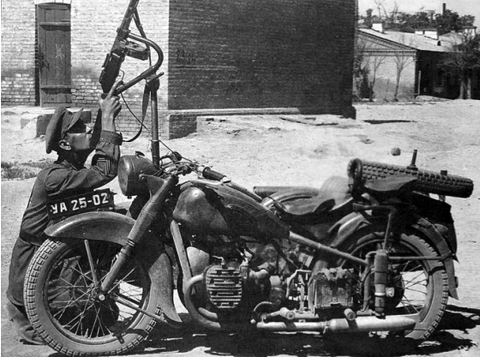 Back in the USSR, now that the original side-valve model had become obsolete, manufacture of the old M72 (BMW R71-based) was offered to their Chinese communist neighbors who wasted no time in dropping the KS500 based machine for the tried & tested BMW R71/M72 design motorcycle. 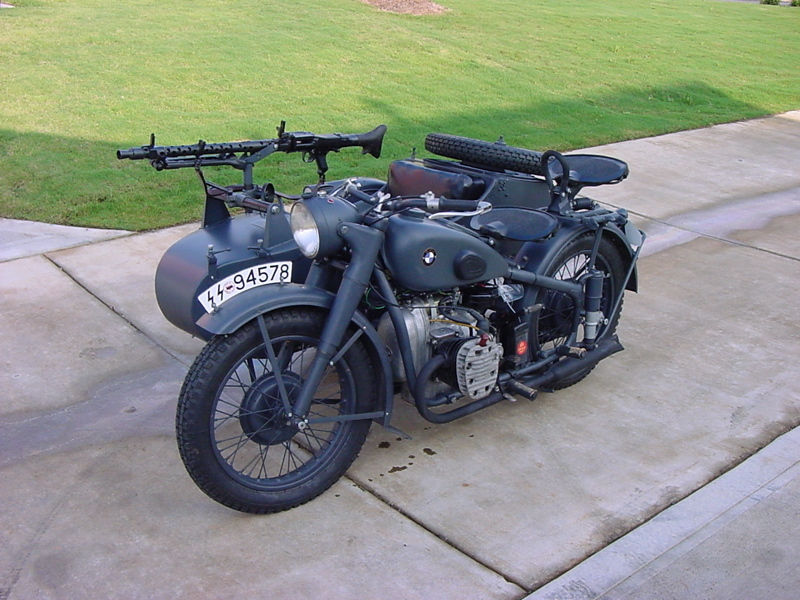 The BMW R71/ M72 sidecar, now renamed the "Chang Jiang" entered production during 1957 at the Chinese Nanchang aircraft factory.